THERE’S been very little gardening done by me since April. 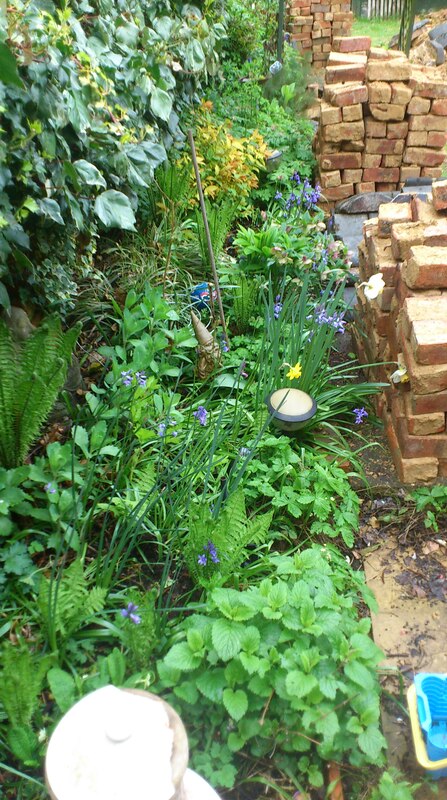 Not because of the wet weather – which hasn’t helped – but because of the couple of tonnes of brick that landed on our back garden two months ago. Since the huge wall fell (see details here) we found that the insurance company wouldn’t pay out because it hadn’t been ‘hit by something’ (yeah, thanks for nothing Cooperative Insurance), and that the neighbouring Jesus Army house wasn’t covered either. This means we do as much as we can ourselves, and then pay £2,000 for a brickie to come and re-build it. Every weekend, every free time that Bloke and I had, we’ve been out in the back garden chipping away at piles and piles of Victorian bricks, getting the mortar off each one, sorting them into piles depending on whether they are still whole, and covering everything with yet more sand and dust. Meanwhile my allotment has been completely neglected – prompting a polite but disappointed call from the allotment committee asking why my plot is such a mess. We’ve managed one trip since then to just strum the worst of it back and stick some beans in. I certainly don’t want it this way, I had high hopes for good crops this year, but have completely missed the window of opportunity because of those damn, damn bricks. We put the majority of the bricks into two big piles and since then have been standing chipping away with chisels and wallpaper scrappers to get rid of the old mortar and leave clean sides. The mortar is like sand, and sometimes comes off easily but mostly needs repeated hitting to dislodge it. It’s boring, mucky, repetitive work. Bloke and I have filled a pallet and a half now, and the bulk of the piles have been cleaned. Next door did a load in the first couple of weeks but haven’t moved on since then, which is frustrating. Their garden was untouched by the fall, while ours is destroyed and our privacy removed. The kids can’t play out and are thoroughly bored because our weekends are spent sorting bricks. The garden has been remarkably resilient. 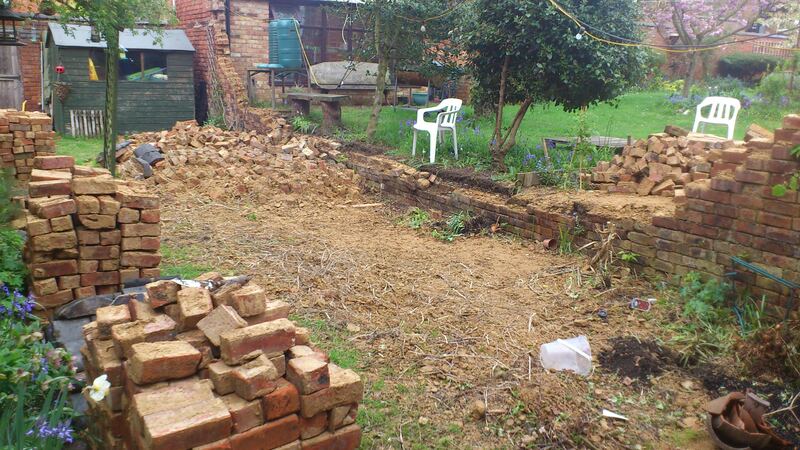 All the plants in the wall-side borders were completely flattened and under bricks for at least a week. However, two large climbing roses have righted themselves, despite no support, and are covered in buds about to bloom. The raspberries were all broken off at the ground but have thrown up lots of new shoots, so I’ve dug them up and put them in big pots. Also moved to pots are the un-killable hardy geraniums, a hosta, another shrub rose, lots of crocosmia bulbs and three varieties of clematis. Still in the beds next to the wall are several huge ferns which came back from the dead and the climbing hydrangea petiolaris, which is in full bloom. Even the lawn is trying hard to recover, although very patchy and full of weeds. The surviving border, which has been neglected because I simply couldn’t get to it to weed, is looking great under the circumstances. But there is a lot of bindweed starting to strangle the foxgloves and delphiniums, and the buttercups, while pretty, are taking over. Ivy on the lower left wall is usually cut right back in May but has been allowed to grow unchecked and is shading the border, making the plants lean for the light. Once the piles are finished, which should be this week on our side, we need to dismantle the remains of the standing wall, which will require a whole lot more chip, chip, bloody chipping. 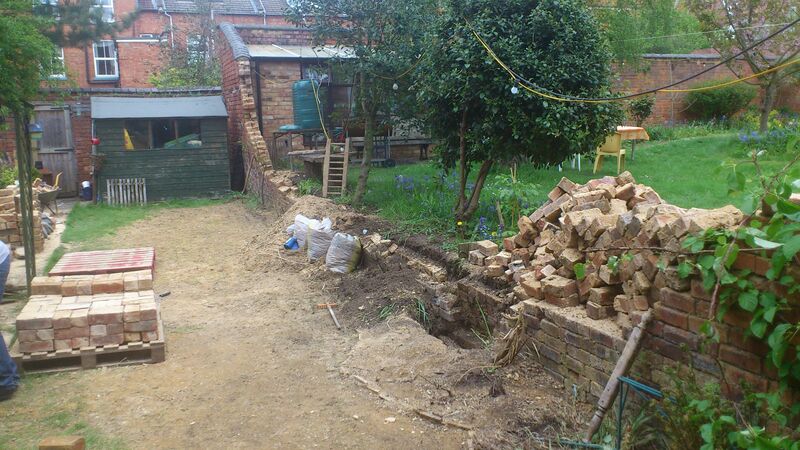 Then we can get the brickie in, if he’ll still come, to decide what to do next. The soil on the neighbour’s side is a foot and half higher than on ours and will need digging out and pinning back. At least the wall seems to have a good foundation. 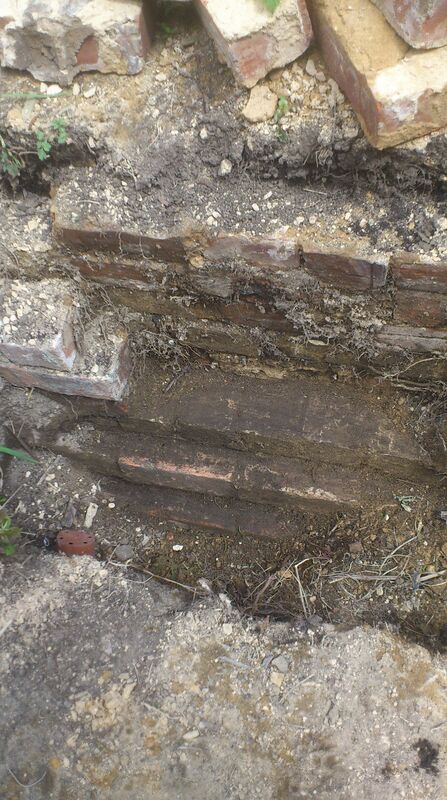 Having expected the bricks to only go down one or two below the soil line on our side, it actually goes down about five bricks deep and even widens at the bottom. It’s all been a thoroughly depressing process which has really brought me very low over recent weeks. It seems ridiculous to get depressed about a garden but every morning it’s so sad to see the garden in such a state. Allotment guilt is weighing heavy on my mind and I’ve just had to kiss off any chance of actual gardening this year. Have you tried http://www.ratedpeople.co.uk One guy, Jon may be a better bet. He is in MK BUT gave me fantastic price. Reply – thanks for tip!